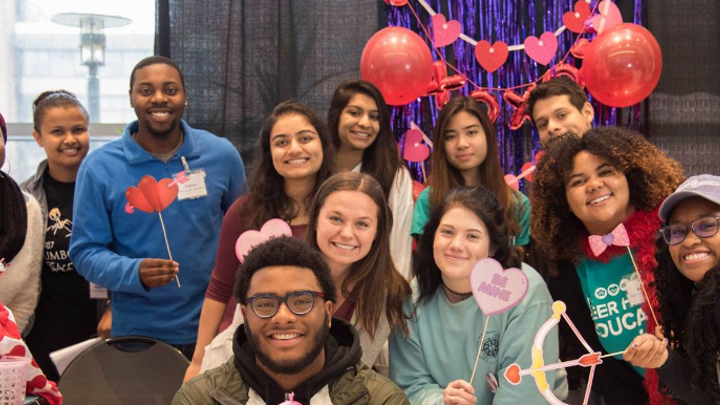 The University Health Services Peer Health Educators have been a long standing student leadership opportunity that has propelled the academic journeys and careers for its past members. Since the early 1990s, University Health Services has offered this experiential learning opportunity to hundreds of Retrievers. Being a Peer provides students with the ability to gain experience in health and well-being, developing public health initiatives, group facilitation, and health communications. The Peer program also provides students with ability to become leaders at UMBC, to make new friends, and to change our UMBC community for the better. Through trainings, skill development, and creativity, Peer Health Educators help students on our campus increase their health and well-being. Each year Peers facilitate 70-80 programs to students, including student organizations, that cover topics such as mental, physical, and sexual health. Through past support, the Peer Health Educator program has been able to provide training retreats, additional professional development resources for Peers, and additional resources to Peers for developing programs. participate in additional professional development opportunities. Your donation is greatly appreciated as well as spreading the word about the great work of the Peer Health Educators goes a long way, too. Furthermore, please encourage students that you may know to apply to become Peer Health Educators in the future. Thank you for your support!